http://i.imgur.com/GKiMRAL.jpg from a blurry iPhone 4S. There was a small overnight rain storm a few days ago too in a So(uthern) CA(lifornia). This was in a rural backyard. 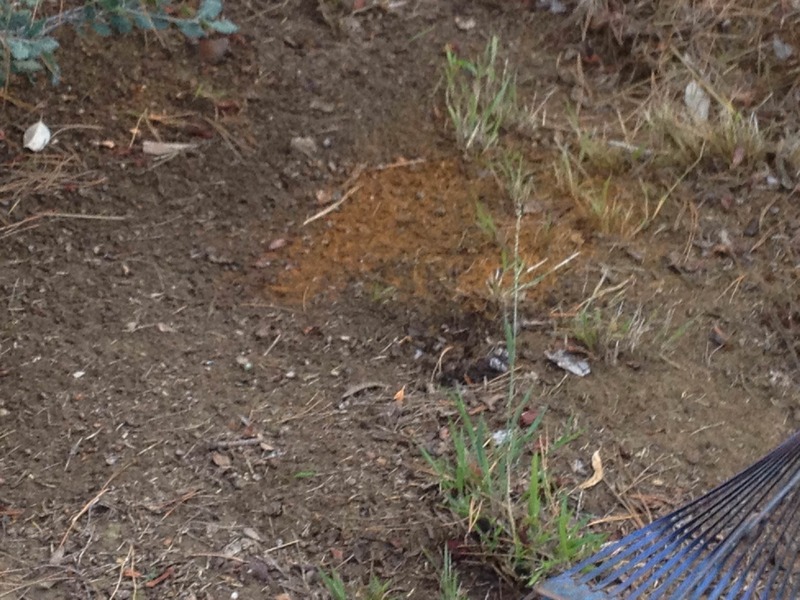 I noticed removing the orange powder and digging shallow reveal the normal brown soil. it seems to only exist above the ground. A Redditor says it might be rust since it matches since the orange is like dust. Also digging under it revealed regular dark brown soil like you see around spot. Were you near the Woolsey fire? If so, that could be Phos-Chek that had been dropped as a fire retardant. The rain would have rinsed it off the foliage in your garden. If it is indeed Phos-Chek, relax. As it breaks down, it becomes fertilizer. Is there a way of telling if there have been power cuts in the night or while out?